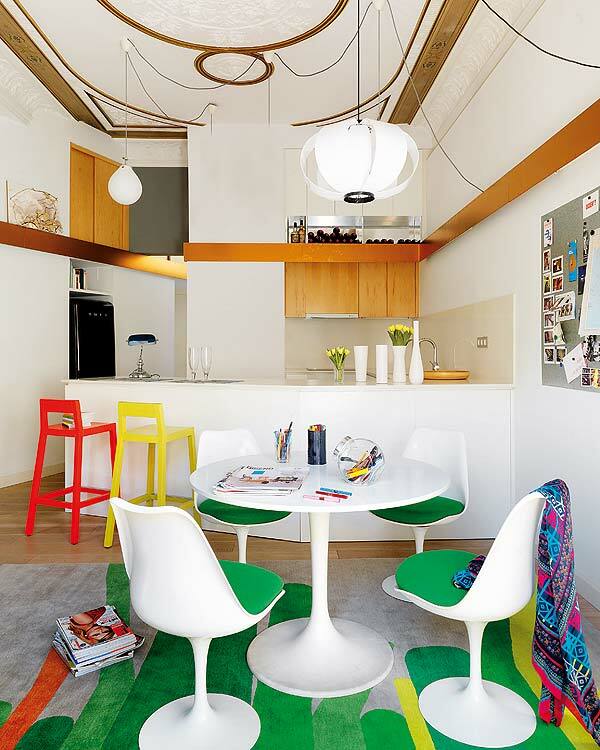 Mix and Chic: Home tour- A colorful modern apartment in Barcelona! 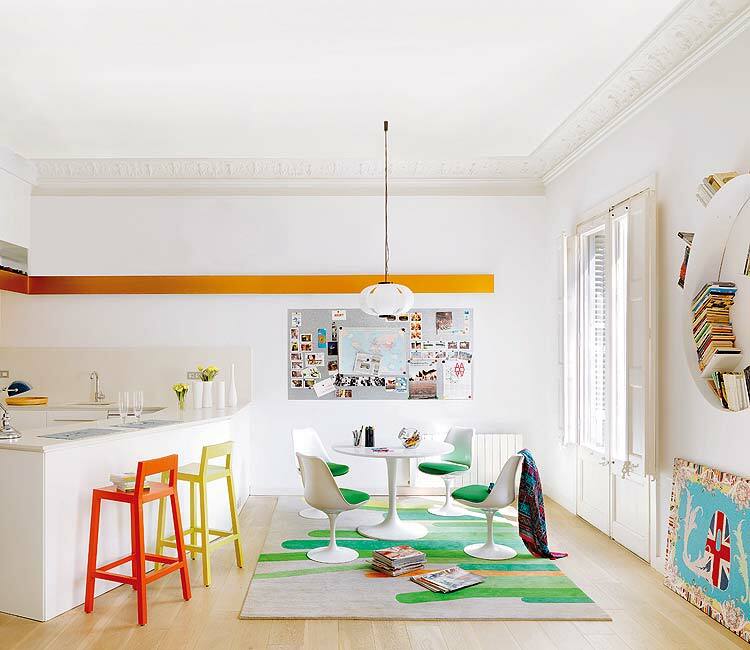 Home tour- A colorful modern apartment in Barcelona! Blessed with gorgeous high ceilings, decorative crown mouldings, big windows and abundance of natural lighting, this beautiful apartment in Barcelona has great features to start with. 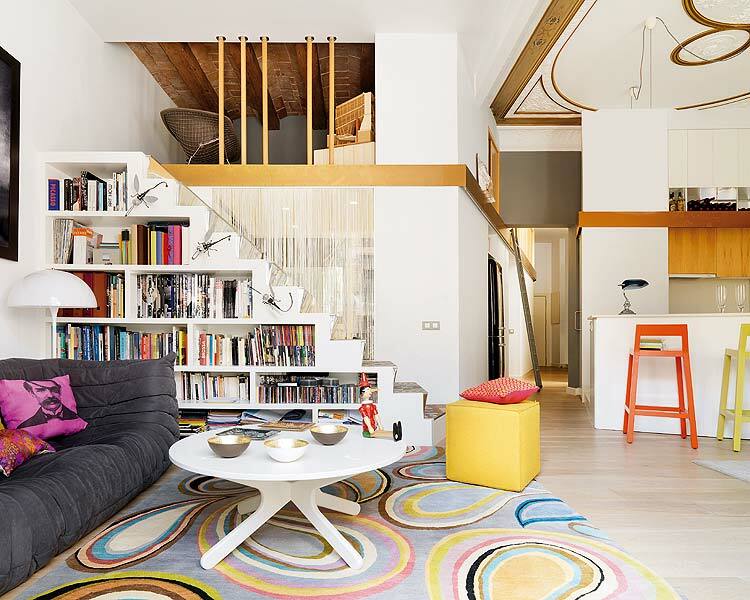 Coupled with a few pleasant surprises like under stairs bookshelves and a few golden strips that run across the walls to hide electrical wiring, this stylish and colorful modern home is a winner! Do you like this apartment? Which element catches your eyes? Hello again! I do like the colors in the apartment but the element that really catches my eye are the bags hanging...in the entrance maybe? Anyway, couldn't expect anything less creative in such a city! 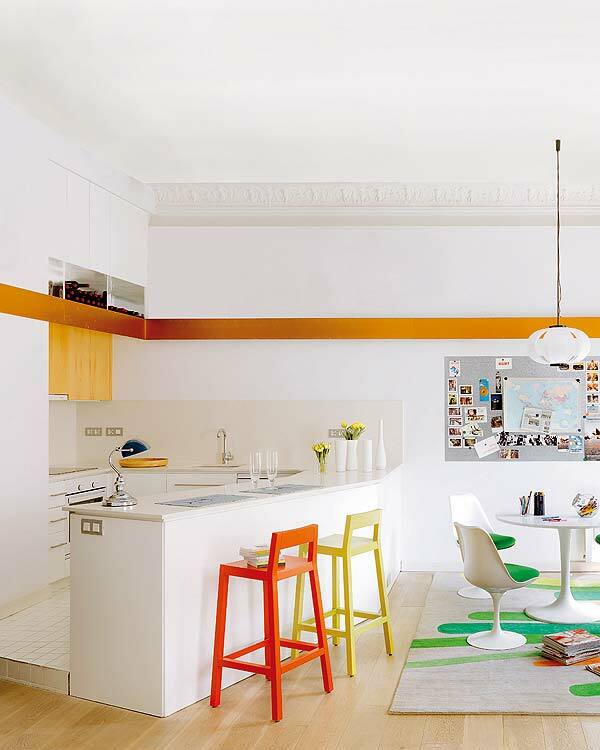 I love the flooring, original architectural detail and the bold use of colours but I'm not so in love with those pendant lights with the wires running to the walls - just feels a bit too messy for me. Very cool home all the same! That is a fantastic apartment. Where do you find all those amazing spaces? Some serious desing classics in this apartment. Look at all the chairs and tables. But my eyes are really drawn to the fantastic photo art. I have not knowm you for very long, Jessie. But I must say that I really enjoy visiting your blog. You have a really great eye. And you go your own way. I like that! But this idea for hanging handbags is definitely one of the wackier, and more interesting ones I have seen. A colourful and quirky-fun home. The whole space is so open and bright but I am most drawn to that fabulous staircase! At first glance the stairs look really slanted! And of course, the added bonus is that the apartment is in one the best cities in the world! I could totally live here! Spanish style is so amazing, love how fresh everything is here. 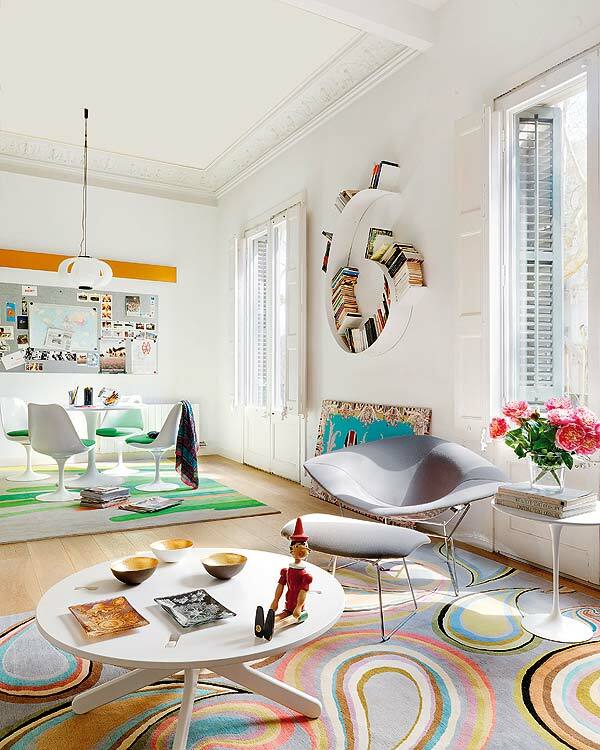 Especially drawn to the rugs! Love the interesting and innovative ways people display books. Bedroom with smoky grey walls is interesting. How could you not smile if you lived in a home like that! SO FUN! The green chairs are so unique. You find great homes! Oooh the rugs here are so much fun!